March 20th sees the release of The Muppets, after the jump learn about obtaining a FREE Muppets coupon. 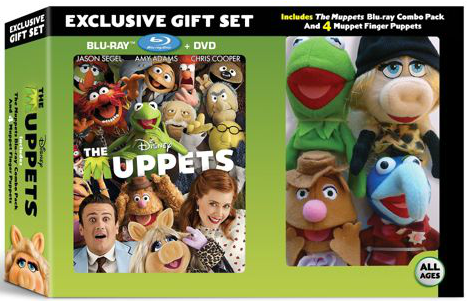 Includes 2-Disc Blu-Ray Combo, box packaging, and four finger Muppets puppets. Both 2-Disc and 3-Disc Editions come with a bonus disc that includes 6 full length episodes of The Muppet Show. The soundtrack/Muppet Show set will run about $29.99, while the version without the soundtrack will run about $24.99. 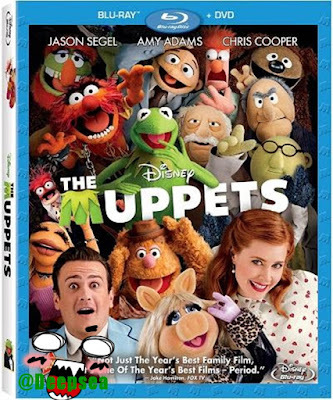 ...and purchase the Muppet Lunchbox ($22.99 with Disney coupon - this also includes the $7.50 steelbook pre-order). Again, dont forget about the Disney coupon, which you can use with the WW pack or lunchbox. This film will be released on March 20th, and the coupon expires on March 25th. Deciding which version you want is like asking what arm would you want to keep. I've already picked up the BB exclusives (which I will unbox soon), but the Walmart one is also appealing for both the soundtrack and the finger puppets. The soundtrack is a digital download, so no hard copy is provided. The BB Lunchbox pack also includes the WW Pack, which means you get the soundtrack, PLUS the Lunchbox for only $27.99. Add the $5 coupon, and your price comes down to $22.99; add the $7.50 Metal Pack, and you're actually down to an amazing $15.49. When you factor all this in, plus the recent price adjustment (originally $39.99 before the coupon), it's hard not to purchase this very desirable set. In my opinion, the BB pack is the way to go, but there are good arguments to be had for the Walmart and Target deals. For those of you who purchased the Lunchbox early (like I did) make sure you get BB to honor the price change. The long road to this release is finally over! Be sure to get your release soon, and stay tuned for my unboxings! !